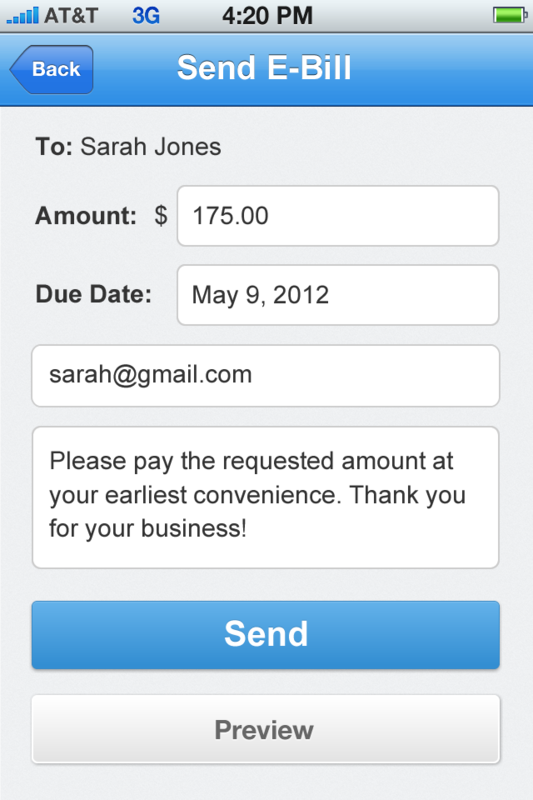 Today, Intuit announced a new iPhone app called MoneyDue that turns calendar appointments into billable services, with payment reminders and the option to send E-bills through the Intuit PaymentNetwork. One of the biggest problems facing small businesses -- contractors, freelancers, and tutors -- is that they don't get paid fast enough," said Yumi Clark, a director for the Intuit PaymentNetwork. "MoneyDue allows users to turn time into money by reminding customers to pay when services are due. The app helps busy small business owners professionally manage money flow from their smartphone." 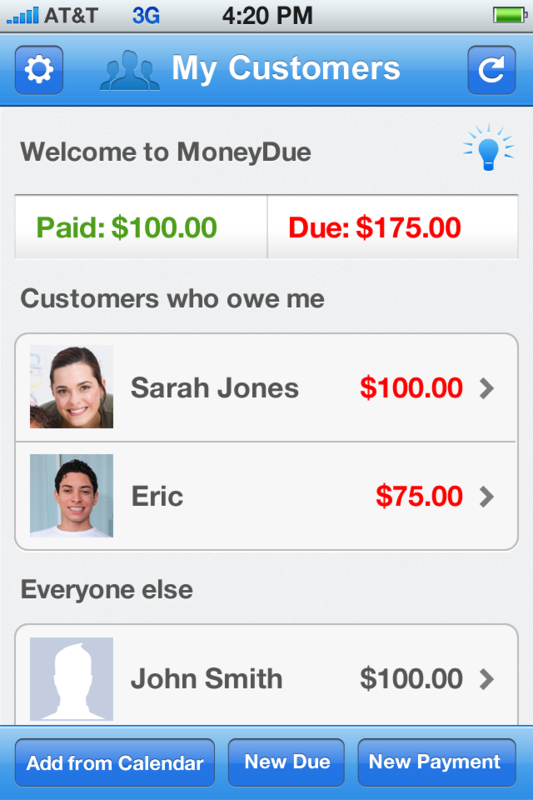 MoneyDue, for iPhone and iPod Touch, is available for free in the iTunes app store. The app syncs with your calendar to turn appointments into money owed. You simply add a dollar amount to the title of the event on the calendar and import it into MoneyDue. The app will ask you to pair it with a contact and then add it to their account as an amount due. All you have to do is make sure calendar events have a dollar amount in the title. The app also tracks payments made by cash or check, and you can send E-bill reminders to clients through the Intuit PaymentNetwork. This online payment service allows small business owners to send invoices with a payment link, so clients can pay online via bank transfer or credit card. Customers can send a one-time payment as a guest, or set up recurring automatic payments. Bank transfers cost 50 cents per transaction, and credit card payments are charged 3.25 percent. There are no setup, monthly, or cancellation fees -- just the per-transaction fees. Intuit PaymentNetwork also syncs with QuickBooks and QuickBooks Online. For some other payment processing options, check out our recent mobile payment-processing service roundup. We had the opportunity to get an early look at the app on an iPhone 4, and it looks good. All you have to do is remember to include a dollar amount in the event title when creating an appointment on the calendar. It can be a one-time appointment or a recurring appointment. MoneyDue shows how much you've been paid and who still owes you. When you open MoneyDue, you'll see a summary of how much you've been paid recently, how much you are owed, and a list of who owes how much. Tap on a client with a balance, and you'll see a list of the individual charges, buttons to add new charges or payments, and a button to send an E-bill. There are also buttons to add a new charge or payment from the home screen, in addition to a button to import charges from the calendar. MoneyDue scans the calendar for appointments in the next 60 days that have dollar amounts attached to them and allows you to choose which ones you'd like to import. The next step is to pair each event with a contact from the phone's contact list. This is the part where I wish there were a bit more automation and filtering. You choose from the phone's full contact list, which means you must mix your client list with all of your personal contacts. Also, there is no way to batch pair similarly named appointments or recurring appointments. You must go through each appointment and link it to a contact individually. Calendar events are imported individually. 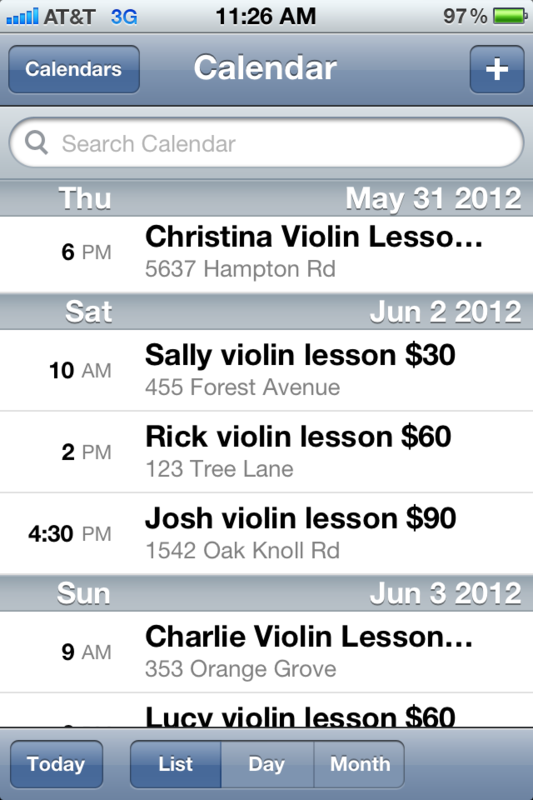 It doesn't take long and it's not a big deal if you only have a handful of weekly clients, but my average studio load of private violin lessons is around 30 students per week. That's more than 200 appointments to click through in a 60-day import. 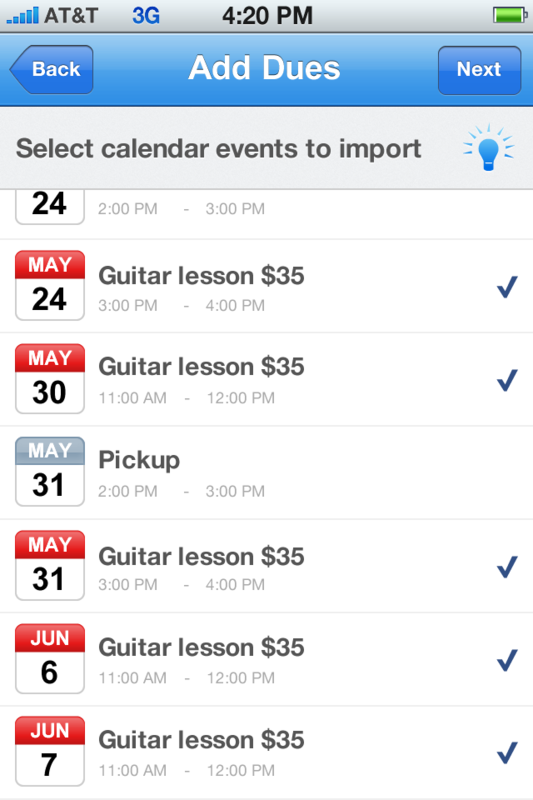 The vast majority of those are recurring weekly lessons, and it would be great if the app could associate a client with a recurring appointment, so I would only have to connect them to the first calendar event and it would automatically connect the rest. Once that is done, tracking and recording payments is easy. When you select an individual client and tap the "New Payment" button, the app assumes that you are being paid the full amount on the current date, but both of those fields are editable if that's not the case. You can leave a note about the payment and choose whether it was paid by cash or check. MoneyDue syncs with Intuit PaymentNetwork to automatically record E-bill payments that were made online. E-bills allow you to send extra reminders to pay. You can also add new fees to a client from within the app, but that will not add an appointment to the calendar. This can be useful if you need to charge a registration fee or some other fee that is not directly linked to a specific appointment. Overall, the app is clean, straightforward, and easy to use. It would work best for someone who manages a handful to a dozen or so appointments a week and already keeps their calendar and client contact list in their iPhone. It does an excellent job of bridging the gap between having a calendar of appointments and keeping track of who still owes you for which appointment. The convenience of E-bills also means you don't have to bring up money in front of kids during their lessons; it can all be done online, outside of the lesson time.